Becoming a dad was probably the biggest factor in my decision to have weight loss surgery. By the time my second child came into my life, I had a BMI of 48.7. I had high blood pressure, my knees hurt and I tired quickly. A 45-minute “Music Together” class brought on fears that the teacher would make us jump or dance for too long. I’d be cautious not to put any extra “oomph” into my jumps so my stomach wouldn’t bounce too much. My physical fitness brought into question my parental fitness in my mind. 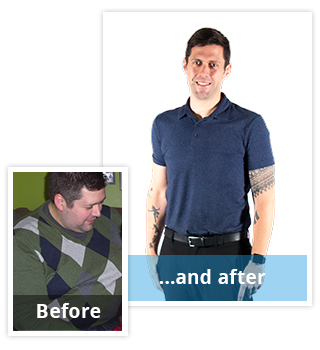 In the previous 35 years, I had never been able to make a lasting change to my weight. I’d dieted, yes. I’d exercised, yes. In fact, I’d lost hundreds of pounds. The problem is, I’d always gained them back. So the question became, what’s next? I’d always felt that bariatric surgery was an extreme option. To have one’s stomach altered to lose weight seemed like too much when I knew I could lose that same weight through diet and exercise. But the reality was that I never achieved permanent change. My definition of “extreme” began to change as I considered what my obesity would mean to my kids. With them in mind, I attended a New Jersey Bariatric Center seminar. After months of counseling, nutritionist visits, tests and about 40 lbs. of hard-fought weight loss before surgery, I had a sleeve gastrectomy on May 1, 2013. Today I’m 170 lbs. lighter, and I know my decision was the right one. I no longer require medication for my high blood pressure. I am more conscious of my own eating because of the limits from the surgery and my kids are eating healthier because of all I have learned. Beyond that, I am happier, more confident and can participate in my kids’ lives without questioning my physical limits. I am now certified by the National Academy of Sports Medicine to provide others struggling with their weight with strategies and help lead them to a healthier life. My decision to have the gastric sleeve was the best one I think I have ever made. There is a significant and lasting improvement in almost every aspect of my life. But the most important change: I have two healthy, active children who now have a healthy and active father.